Jennifer Stenhouse currently makes her home and studio in Seattle, Washington. She has been teaching art and jewelry classes, workshops, lectured and exhibited throughout U.S. and Mexico for over 20 years. Jennifer attended the University of New Mexico, where she received her BFA in printmaking 1989. During this time she began making elaborate small scale sculptural mixed media work. 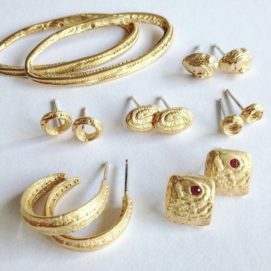 Due to the intimate scale of these pieces, she employed the use of small tools and techniques, refocusing her studies in the environment of the jewelry studio. 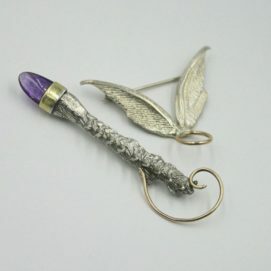 She attended University of Wisconsin Madison in 1989, she began studying Metals and Jewelry, where she completed her MFA in Fine Arts in 1992. 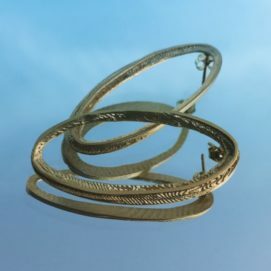 Jennifer began teaching at Savannah College of Art and Design in 1992, in Foundations and Jewelry classes as elective, which lead to her proposal and the development of a new Metals and Jewelry Department. While in Savannah she also maintained a small studio in the Historic City Market. In 1997, Jennifer began teaching jewelry, printmaking and drawing, at the Vermont Art Exchange in North Bennington, Vermont. At VAE she taught several classes and workshops in jewelry, printmaking and drawing. Currently Jennifer teaches jewelry classes and workshops at locations in Seattle, Washington.